Monet’s House and Garden at Giverny will open in exactly one month, on April 1st. You can already buy your admission tickets on-line, by following this link. It is wise to buy your ticket in advance, because lines can be long sometimes, especially on sunny days. In 2012, the admission fare at the till is 9 euros for an adult, 5 euros for young people between 7 and 25 (free for kids up to 6 years old). For an e-ticket you will pay an extra cost, but it is not expensive. You can book your admission for any day from 1st April to 1st November, 2012. Fondation Monet is open 7/7. The best day to come is generally Wednesday. The best time: late afternoon, after 4.00pm, on week-days, because most visitors leave early to get back to Paris. Or, on week-end, a good tip is to come early in the morning. With your e-ticket you can get in as early as 9.15am. When in Giverny, make your way to the Group Entrance with your advance ticket, (not the individual entrance, because it is for people who don’t have their ticket). The Group Entrance is located at the bottom of the garden in a small lane called ruelle Leroy. It is next to the road D5 coming from Vernon. You will show your e-ticket to a security member, and in you are! It is only a few steps to the water garden. 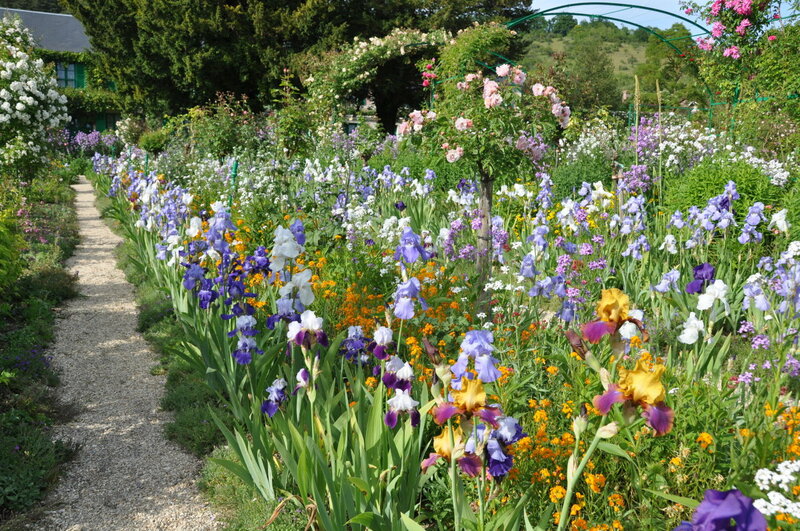 I really recommend purchasing e-tickets, because many people are very surprised to see how busy Giverny is. 611 000 visitors came in 2011, all of them within 7 months only! To make most of your time and enjoy the very special atmosphere of Monet’s gardens, choose carefully the day of your visit. Unless it rains, you can expect crowds on long week-ends in Spring like Easter, 1st and 8th of May, Ascension Day, Whit Sunday. Your vacation time is short, it is not fun to waste it queuing.